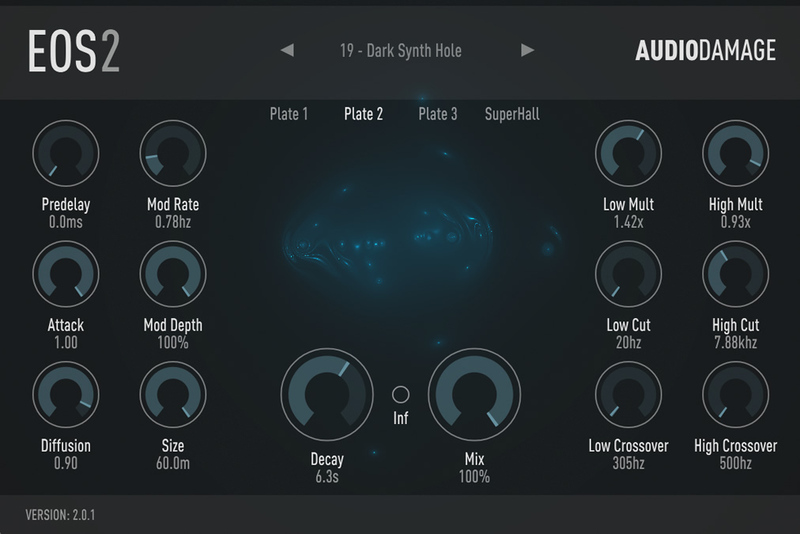 Eos by Audio Damage is a Virtual Effect Audio Plugin. It functions as a VST Plugin, an Audio Units Plugin, a VST 3 Plugin and an AAX Plugin. Eos consists of four high-quality custom-designed reverb algorithms, made with the modern production environment in mind. Three different plate simulators and a "Superhall" algorithm give you a broad palette of reverb, and the easy-to-understand interface makes adjusting the algorithms to suit your track incredibly simple. I went through a phase when I was addicted to trying and buying different reverbs. Reverb, to me, is one of those effects where each one you use has its own unique character; therefore, I felt it was impossible to have too many reverbs. Eos is one of the select few that I'm still happy to have purchased. If I had to describe Eos' sound in a word, that word would be dense. Eos isn't understated. It's not for adding a little spaciousness to a sound. Eos is extremely rich and cavernous. Some reverbs need to be coaxed into sounding nice and full, but Eos needs to be tamed. It especially sounds wonderful on trance leads and anything that needs to soar and fill out its space in the mix. The interface is pretty simple; it's attractive, and there are enough options to explore, but not enough to be overwhelming. And for $50, the price is pretty much right. I don't get as much use out of Eos as I'd like, mostly because the music I produce usually doesn't call for such a powerful reverb, but when I do need it, I'm glad I have Eos around. This little VST is probably one of my favorite. The facility to operate comes handy when on a tight deadline. The sound is pretty much amazing and it does what I want it to do, which is to add depth and some unreal spaces to some tracks and effects. The presets are useful as is or as a starting point for programing your own. The visuals are pretty basic but right to the point, no fancy stuff just for a nicer look, but easy to handle parameters. I am maze at how this VST can add depth, the modulation on the reverb is very effective and I love the crispness it have in it, without having to much noise quality. Even on tight space the color of the effect is interesting. But I have to admit that I use this plug mostly for very large spaces, the infinite preset is really a jaw breaking one. 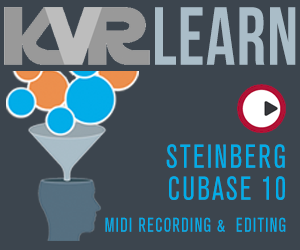 This VST is a must for any serious sound designer or producer. I must admit it : this reverb is awesome! The best i've ever used, especially good on Trance genres like uplifting, ambient etc. I just love it, it can bring live to leads, move pads into othewordly space. Its hard to believe, but insane sound quality of this plugin goes hand in hand with CPU-friendliness, i mean if I put Eos on any track, CPU meter in Ableton doesnt want to jump up to one percent... This is uncommon. It has 3 algorithms and all 3 sounds gorgeus, but my absolutely favourite is hall, as I am trance producer. I was looking for a good reverb for a long time, tried almost every available on the market, but srsly, only Eos (and maybe EasyVerb from PSP) is as good as I need it to be. And the best part is price... 49 buck for that quality plugin (yeah its simple, but it sounds good and thats all that matters)... Must have. Believe me. I want to love this plugin. Love the Gui, and the easy controls. I like most things that AD does, and they are a big part of my tool box. Eos is always too heavy though. I find that I need to have the wet/dry knob at about 98% dry all the time, regardless of the settings elsewhere, or else everything sounds like if you where a bat in a cave. Maybe I'm missing something? Are you using Eos as an 'insert' effect on an individual track - this wouls possibly make balancing a lttle harder (but not to the degree that you seem to be describing). If using a 'send' you should have a mix/send level which would give you more control. I have EOS and have not had an issue 'balancng' the right amount of signal to it. You're definitely doing it wrong. I have noticed Eos produces some constant low-level noise even when no sound is feeded into it. With just one instance the noise level seems to average somewhere around -105 dBFS, which of course is completely inaudible. In larger projects, though, with multiple instances, the noise level builds up and can easily mess up dithering and may even come audible at some point. So I recommend using noise gate with Eos. By the way, I tried stacking 10 instances with big and long reverb settings on one channel and the noise came clearly audible. I bounced and normalized a clip, and I must say the result sounds really creepy. If there are any drone/dark ambient producers out there, you might make use of this noise leakage. ;).